The iQ5 enables you to create anywhere and stir the world around you. Blur the line between observer and instigator by matching significant content with quality sound. 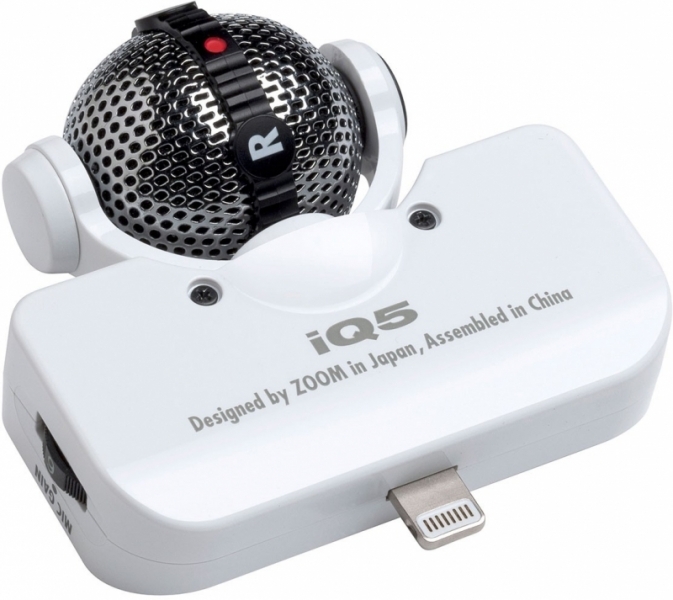 The iQ5 employs a unique rotating mechanism that enables audio recording with correct left-right stereo orientation whether used vertically or horizontally. Use it in standard “audio” position or simply rotate it to the “video” position in order to record video with the attached iPhone, iPad, or iPod Touch held horizontally. Mid-side recording makes it easy for anyone to record in realistic (and fully mono-compatible) stereo. The iQ5 contains two microphone elements: a directional “mid” mic that captures audio coming from in front and a bidirectional “side” mic that covers ambient signal. The iQ5 makes it easy to capture great sound no matter what type of material you’re recording. Dial in the exact input level you need with the analog-type MIC GAIN wheel, choose Auto Gain to automatically set the perfect recording level, or use the Limiter setting to avoid overloads. The iQ5's dedicated headphone jack enables direct monitoring during both recording and playback. 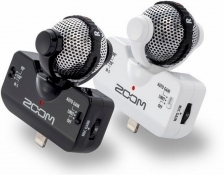 Zoom's free Handy Recorder app is specially designed for use with the iQ5. Simply download it from the App Store and install it on your iOS devices. The Handy Recorder app allows you to record in linear PCM (WAV) 16-bit/44.1kHz format for CD-quality audio that accurately captures the full subtlety of acoustic instruments and spaces. When you need to conserve storage space for long recordings, you can instead record in compressed AAC format for smaller file sizes and faster data transfer.